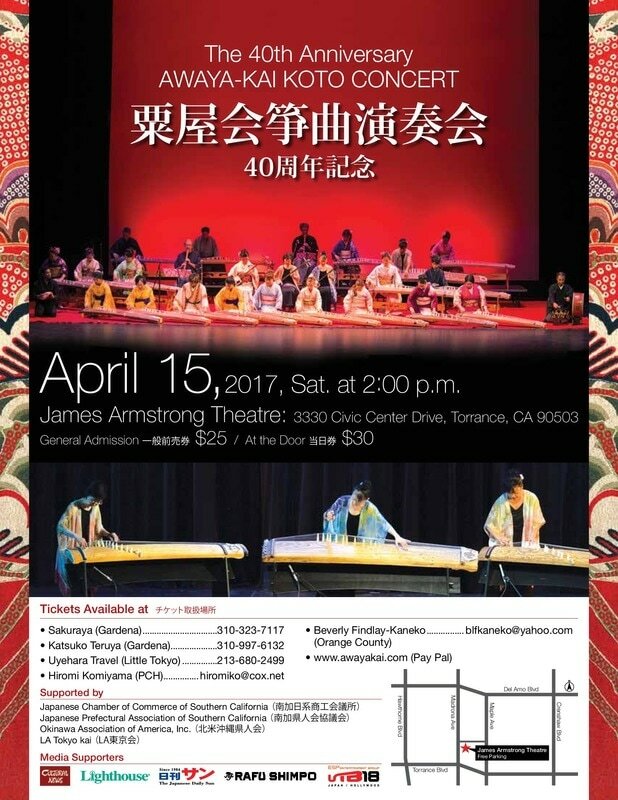 The Yoko Awaya Koto Music Conservatory (Awaya-kai) will present the 40th Anniversary Awaya-kai Koto Concert on Saturday, April 15 from 2 p.m. at the James Armstrong Theater in Torrance. The concert program is a diverse, international mix of musical genres to be performed by Awaya-kai members and special guest musicians and dancers. Mrs. Awaya enjoys exploring many styles of music and collaborating with international artists. This concert is no exception. Awaya-kai members will be joined by Flamenco artists Paco and Yolanda Arroyo, who hail from Spain, and Chinese erhu player Yun-he Liang. In addition to Flamenco-style music such as “Burlerias,” “Pendulum” and “Cancion,” there will be koto classics and Japanese folk songs, and an exciting Anime theme song. Program highlights from Okinawa include folk music, dancing and the Nation of Ryukyu Festival Drums. A portion of the proceeds will be donated to Kumamoto Kenjinkai to support the victims of Kumamoto Earthquake. 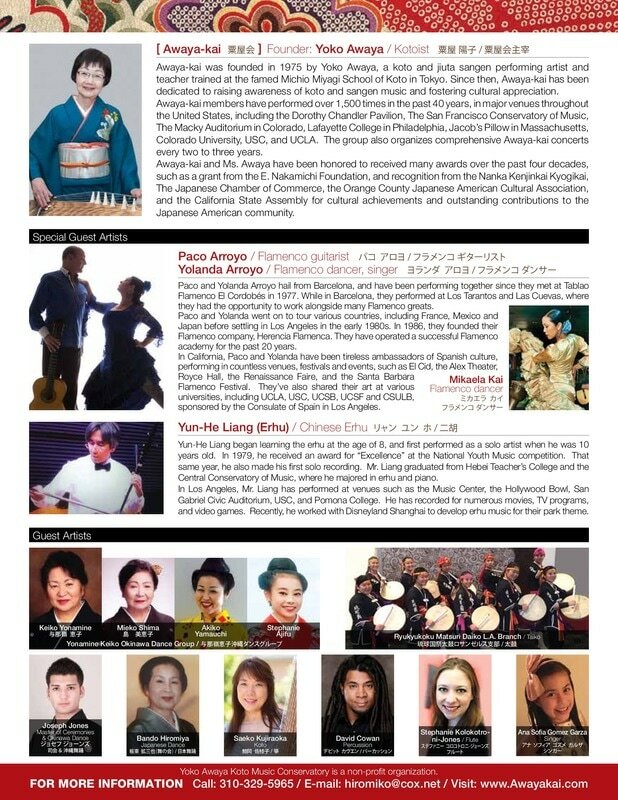 For tickets, please click "Buy Now" button below (payment by Paypal), or call Katsuko Teruya at (310) 997-6132, or Beverly Findlay-Kaneko at (714) 651-0734, or email Hiromi Komiyama at hiromiko@cox.net, or Beverly Findlay-Kaneko at blfkaneko@yahoo.com. Tickets are also available at Sakuraya in Gardena (310) 323-7117, ​or Uyehara Travel in Little Tokyo (213) 680-2499.